Centralizing all your business processes. I’ve been reviewing some of the tutorials online and I wanted to compliment you. Good job! This is one of the best FM programs I have seen in my 18 years working in FileMaker. 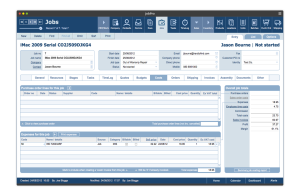 JobPro Central is a comprehensive business software template which contains elements such as contact, job and time management, budgeting, scheduling, order processing, invoicing, assembly and inventory management that are further customisable. JobPro is a FileMaker Pro based database. FileMaker Inc. an Apple subsidiary, delivers innovative software to deliver custom business solutions for Windows, Mac, iPad, iPhone and the web. Millions of people, from individuals to some of the worlds largest organisations, use FileMaker platform to streamline their business processes, manage essential information and boost overall productivity. Many of our customers work with JobPro right out of the box but a key feature of our system is its ability to allow us or you to customise the workflow to make it exactly right for your business needs. We have nearly 20 years experience delivering cost effective custom designed process workflows across many industry types. You need a comprehensive out of the box solution with perhaps the ability to build on it over time. You need a flexible platform that allows you design and deliver the type of workflows specific to your industry. You have looked at packaged apps but their rigid design does not meet your business need. You are looking for something more cost effective and flexible than boxed applications. You are looking for a scalable solution that can support both desktop computers, iPad, iPhones and the web. You want an application that can integrate with other data sources to bring everything together. JobPro is modular and suits companies of all shapes and sizes. Whether you are single user or large organization, JobPro fits all. Run JobPro on Apple Mac, Windows, iPads & iPhones with hosting on your own server or the cloud and integrate with popular accounting packages. Access JobPro live or use the JobPro2Go offline app. JobPro is a FileMaker Pro database and can be customized in any way. Join our happy customers and request a live demo.